Status: Locally fairly common breeder central and east, rare casual west. Rare spring and fall migrant (away from breeding sites). State and federally listed as Threatened. Documentation: Specimen: UNSM ZM6102, 17 Jun 1902 Keya Paha Co.
Taxonomy: Miller et al (2009) showed that Atlantic Coast birds (melodus) were genetically distinct from a group comprised of Great Lakes and Northern Great Plains populations (circumcinctus). Three distinct breeding groups are recognized by U.S. Fish and Wildlife Service: Atlantic Coast (threatened), Great Lakes (endangered), and Northern Great Plains (threatened). Migrants are first seen in mid- Apr, peaking in numbers during the latter half of Apr and early May. There is an earlier date, 6 Apr 2016 at Conestoga Lake, Lancaster Co.
High counts: 19 at Harvard WPA, Clay Co 3 May 2005 (Jorgensen 2012), 11 at Lake McConaughy, Keith Co 30 Apr 2018, seven at a privately-owned wetland in Clay Co 22 Apr 2001, and seven at Fremont Lakes, Dodge Co, 26 Apr 2016. Summer: Regular nesting in Nebraska is restricted to the Missouri, Platte, Elkhorn, Lower Loup, and Lower Niobrara River systems. Suitable habitat, consisting of expanses of sparsely or un-vegetated sand adjacent to water, including sandbars, beaches, and off-river sites such as sand and gravel mines, dredging operations, and lakeshore housing developments (Brown et al 2011) is determined by water levels in rivers, lakes, or reservoirs. Variable numbers of birds occurring in response to fluctuating amounts of available habitat, as well as exchange (i.e., emigration- immigration) between nesting areas, makes it difficult to determine whether breeding numbers are increasing or decreasing in Nebraska. Piping Plovers are monitored annually or nearly so by an array of entities because of their protected status. Beginning in 1991, and at five-year intervals since, a statewide survey has been conducted under the auspices of the International Piping Plover Census (IPPC; Haig and Plissner 1992). Nebraska totals included in the IPPC, not including the Missouri River, which is included with the South Dakota portion of the IPPC, were 398 in 1991 (Haig and Plissner 1992), 366 in 1996 (Plissner and Haig 1997), 308 in 2001 (Ferland and Haig 2002), 718 in 2006 (Elliott-Smith and Haig 2009), 348 in 2011 (Elliott-Smith et al 2015), and 343 in 2016 (Jorgensen 2016). In the Missouri River Valley, nesting occurs from Gavin’s Point Dam downstream to near Ponca SP, Dixon Co. South of Dixon Co the river has been channelized, and suitable nesting habitat is generally absent. Nesting also occurs on artificially-constructed islands in the upper portion of Lewis and Clark Lake and upstream of the “delta” in Lewis and Clark Lake to the South Dakota border. Adult Piping Plover numbers generally decline markedly during years of high flow on the Missouri River, but numbers and population growth rate increase in years immediately following those high flow events, which scour, replenish, and create midstream river sandbar nesting habitat (Hunt et al 2017). Low counts occurred in two years of high flows, 1997 (82 adults) and 2011 (182 adults), and the high count occurred in 2005 (1764 adults), when flow was fourth-lowest on record. In years of high flow, when habitat is scarce or absent, birds may not nest or may disperse to other areas. Banding data show regular exchange between plovers from the Gavin’s Point Reach of the Missouri River and the lower Platte River and its tributaries in Nebraska (Hunt et al 2013, Catlin et al 2016). One plover, banded as a chick on 1 Jul 2012 on a sandbar in the Missouri River near Gavin’s Point Dam, was photographed in migration at Branched Oak Lake, Lancaster Co on 16 Apr 2017; it had passed the intervening winters on the Florida Gulf Coast. In the Platte River Valley, breeding extends west to Lake McConaughy, Keith Co, where plovers were first observed in 1978 (Rosche 1994). Since the initial discovery, the species’ occurrence and abundance at Lake McConaughy has varied but generally mirrors lake water levels. In 1993, when the lake level was at a record low, 138 birds (69 pairs) were counted there (Peyton 2004). A period of low water levels beginning in 2000 saw even larger numbers, peaking in 2004 as the lake approached record low water levels, when 330+ individuals and 183 nests were counted (Peyton 2004). Although there was habitat reduction resulting from rising water levels, 2007 had the 2nd highest tally of nests with 245 (Peyton and Wilson 2007). Only 38 adult plovers were recorded during the 2011 IPPC, compared to the 358 counted in the 2006 IPPC. In 2013, lake water levels began to increase and a total of only 86 nests were monitored during the 2013 season (Zorn and Wilson 2016). In 2016, only 10 adults and nine nests were found when the lake was near full pool (Zorn and Wilson 2016). Also, in 2016, 18 Piping Plovers and 12 nests were found on sandbars in the South Platte River created by flooding in previous years (Zorn and Wilson 2016). In the Platte River valley between the North Platte–South Platte River confluence and the Loup–Platte River confluence, including the central Platte River region between Chapman and Lexington, nesting has occurred on both off-river sites and river sandbars (Dinan 1986, Ziewitz et al 1992). The Platte River has been altered by water development beginning in the late 1800s and those impacts are most pronounced upstream of the Loup confluence. The alterations have resulted in reduced flows which have led to narrower channels and woody vegetation encroachment (Williams 1994, Johnson 1994, NRC 2005). These changes likely reduced the habitat quality of riverine habitats used by Piping Plovers. However, the role of riverine and off-river habitats in supporting Piping Plover nesting in the Central Platte River Valley is controversial (see Farnsworth et al 2017 and response, Alexander et al 2018). 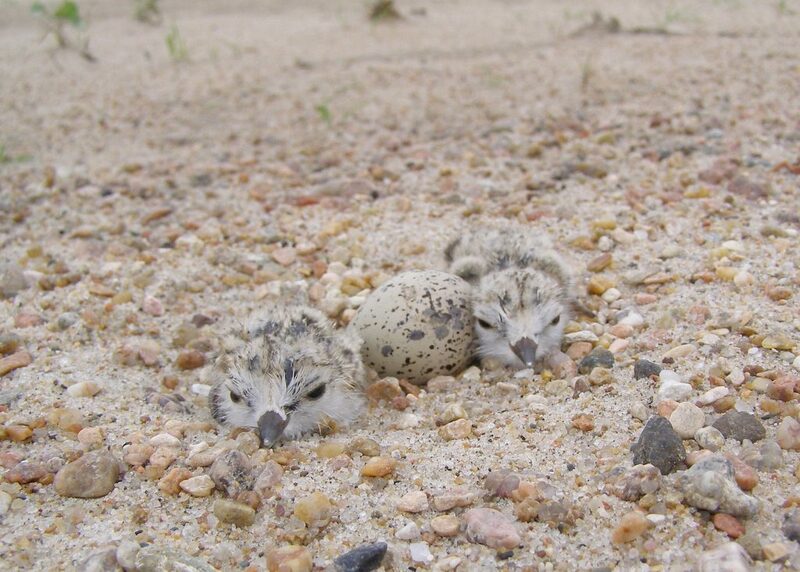 Water projects, especially those proposed since the 1980s since Piping Plover (and Interior Least Tern) were federally listed under the Endangered Species Act, have generally required habitat mitigation for the listed species. Mitigation has included mechanical creation and management of nesting habitat on both off-river and riverine sites. However, riverine sites have generally been unsuccessful while off-river habitats have generally been successful when intensively managed (NPPD 1994, Czaplewski et al 2005). Since the early 1980s, proportionally fewer nests were observed on river sandbars. Since 2007, the Platte River Recovery Implementation Program (PRRIP) has intensively managed habitat in the region from Lexington to Chapman, mostly at off-river sites. In 2014, a maximum number of 69 Piping Plovers was recorded along the Central Platte River Valley (Cahis and Baasch 2015). However, few nests (<10) have been detected at in-channel habitats (i.e., sandbars) in the Central Platte River in recent years (Cahis and Baasch 2015). Along the lower Platte River from the Loup River confluence to the Missouri River confluence, the number of nests recorded on river sandbars since 2008 has ranged from 47 in 2009 (Brown and Jorgensen 2009) to zero in 2015 (Brown et al 2016). Piping Plovers most commonly nest at off-river sites in the lower Platte River Valley. Off-river sites are either active sand and gravel mines or retired mines which are converted to lakeshore housing developments (Brown et al 2011). The number of nests recorded at off-river sites since 2008 has ranged from 42 in 2008 (Brown and Jorgensen 2008) to 83 in 2017 (Brown et al 2017). Nesting in the Loup River drainage extends west to Valley and Howard Cos (Sidle et al 1991), but only small numbers (< 20 pairs) nest on the river and at off-river sites. A nest with eggs was found on the Middle Loup River in Blaine Co 28 May 1987 (Mollhoff 2001) and a pair was incubating near Milburn Dam, Blaine Co, 27 May 2010, apparently at the same site as the 1987 record. In the Niobrara River Valley, nesting reaches as far west as Brown Co with most nesting occurring closer to the confluence with the Missouri River (Mossman and Brogie 1983, Ducey 1989, Plissner and Haig 1997). The 2011 IPPC recorded 104 adult plovers on the Niobrara River, 30% of the total for the state. Adolf et al (2001) found 125 adult plovers along the Niobrara River. Until 2016, the only other breeding season reports westward in the Niobrara River Valley are a specimen from Keya Paha Co (cited above) and a pair and a single found at Lakeland, Brown Co, 29-30 May 2004 but absent 3 Jul. In 2016 two nesting locations were discovered on Niobrara River sandbars in Keya Paha and Rock Cos; one was west of the Carns Bridge the other west of the Highway 137 bridge (Gordon Warrick, NPS, personal communication). Away from these major sites, nesting records are few. The only site used somewhat regularly is at Goose Lake, Crescent Lake NWR, Garden Co. A sand island was renovated in Goose Lake around 2006 and on 8-9 Jun 2007 hosted six adults with three nests; 2-3 eggs and 2-3 one-day-old young were seen there 22 Jun (Mollhoff 2008). One or two pairs were present 2008-2009 (Mollhoff 2008). High water levels in 2010 eliminated nesting habitat on the island and birds nested on a nearby gravel road, which they continued to do for several years; in 2011 a nest was found on the gravel road near Rush Lake, about a mile northwest of Goose Lake (Dan Leger, pers. comm.). Nesting has not been recorded in recent years and this site now appears abandoned. There apparently was a breeding population in the Sandhills at least until 1917. There is a nesting record from Clear Lake, Cherry Co, now within Valentine NWR, on 17 Jun 1902 when four adults (UNSM ZM6108-11) and two chicks (UNSM ZM6112-13) were collected. Swenk (Notes After 1925) noted there was a pair of adults and four eggs collected 23 Jun 1917 at Crescent Lake in the Black Collection at Kearney State College. Nesting has occurred in the southwest and in the Panhandle, but none of the sites appear to have persisted, mainly due to fluctuating water levels. A pair with a nest at Lake Minatare, Scotts Bluff Co on 19 Jun 2004 is the first known Panhandle breeding record; this reservoir was at very low water levels in 2004 due to drought. In 2005 a displaying male was at Lake Minatare on 17 May (Mollhoff 2005) and four birds were present 19 May. A nest was found 20 May, but due to rising water it was unsuccessful; the pair re-nested but was again unsuccessful. Single birds appeared at the site 30 Apr 2006 and again 28 Apr 2007. A displaying male was seen at Oliver Reservoir, Kimball Co 10 Jun 2007, and a pair was courting and digging nest scrapes at Swanson Reservoir, Hitchcock Co 13 May 1999. Nesting was documented on a strip of sandy beach that was produced by a dredging operation at Capitol Beach Lake, Lancaster Co in May and June 1922 (Pickwell 1925). Eggs: 21 Apr-1 Aug (N = 585). Newly-hatched Piping Plover chicks and an unhatched egg on a lower Platte River sandbar in Sarpy Co 24 July 2008. Photo by Joel G. Jorgensen. There are nine later reports: 29 Sep 2011 Platte Co, 1 Oct 2005 Pierce Co, 3 Oct 1985 Platte Co (Williams 1986), 5 Oct 1991 Saunders Co, 8 Oct 2011 Knox Co, 28 Sep-11 Oct Branched Oak Lake, Lancaster Co, 18 Oct 2006 Lake North, Platte Co, 24 Oct 1992 Saunders Co, and 27 Oct 2006 Lancaster Co. Piping Plovers are known to migrate early in fall. Among 474 wintering ground observations of color-banded birds from Nebraska, the earliest known arrival date was 23 Jun (Lauren Dinan, NGPC, personal communication). Away from nesting areas, migrants are usually first noted in mid-Jul, and most depart Nebraska by early Sep. At Lake McConaughy in 2001, 62 birds were present on 21 Jul, but only 13 remained by 20 Aug. Jorgensen (2012) noted that there are no fall records for the eastern Rainwater Basin. One-year old non-breeding birds may undertake leisurely northward migrations during the summer; one color-banded as a chick near Gavin’s Point Dam in 2005 was seen near Valley, Douglas Co on 13 Jul 2006 but then later near its hatching site 23 and 25 Jul 2006. A bird banded in Jun as a chick on an alkali lake in North Dakota (fide Megan Ring) was photographed at Tamora WPA, Seward Co 31 Jul-2 Aug 2017. High counts: 15 at the mouth of the Niobrara River, Knox Co on 27 Jul 2016 and 6 at Harlan County Reservoir, Harlan Co on 2 Aug 2003. Comments: Zeigler et al (2017) undertook a study of Piping Plover metapopulation dynamics as affected by high-river flow events and projected effects of climate change using the Gavin’s Point Dam, lower Platte River, and Lewis and Clark Lake populations. While noting that the metapopulation has been “substantially reduced under the current suppressed disturbance regime (high-flow interval ~20 yr)”, Zeigler et al (2017) concluded that a high-flow return every four years would “maximize metapopulation abundance”. Zeigler et al (2017) stated that “The presence of even a small, stable source sub-population” such as those involved in this study, “even if unintentionally maintained through anthropogenic activities”, helped buffer the metapopulation from extinction risk. Zeigler et al (2017) concluded that projected climate change “could have positive effects in ecosystems where disturbances have been anthropogenically suppressed” as increased disturbance regimes move “toward more historic patterns”. A study by Catlin et al (2016) investigated Piping Plover responses to artificial habitat creation (“Emergent Sandbar Habitat”) on the Missouri River in the Gavin’s Point Reach and near Niobrara, Knox Co, on Lewis and Clark Lake. These authors concluded that efforts to increase plover population numbers by nest exclosure and predator control efforts would be successful only if additional habitat was created that provided nesting habitat for the increased numbers of birds. Sandbar nesting habitat on the lower Platte River, Cass County, Nebraska, 26 July 2008. Photo by Joel G. Jorgensen. 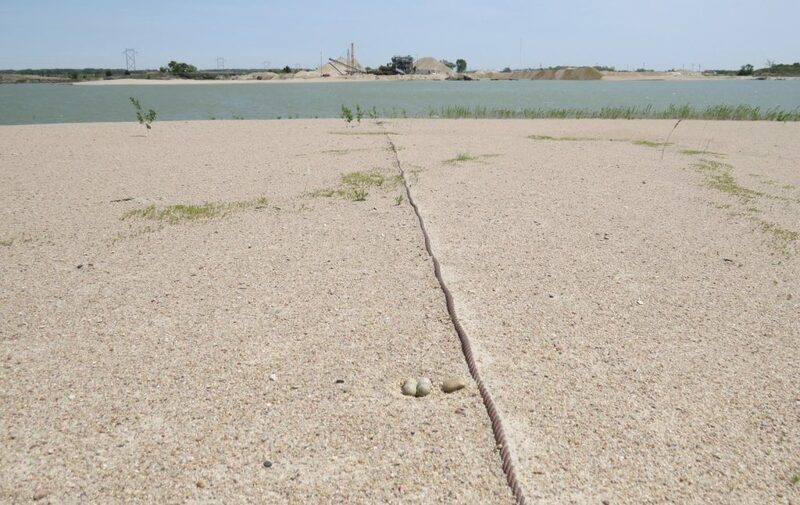 Piping Plover nest at a sand and gravel mine in Platte Co 21 May 2014. Photo by Lauren R. Dinan. Adult Piping Plover on nest with protective exclosure at a housing development in Colfax Co 5 Jun 2009. Photo by Lauren R. Dinan. Adolf, S.L., K. Higgins, C. Kruse, and G. Pavelka. 2001. Distribution and productivity of Least Terns and Piping plovers on the Niobrara River. Proceedings of the South Dakota Academy of Science 80: 231-245. Brown, M.B., and J.G. Jorgensen. 2008. 2008 Interior Least Tern and Piping Plover Monitoring, Research, Management, and Outreach Report For the Lower Platte River, Nebraska. Joint report of the Tern and Plover Conservation Partnership and the Nongame Bird Program at the Nebraska Game and Parks Commission, Lincoln, Nebraska, USA. Brown, M.B., and J.G. Jorgensen. 2009. 2009 Interior Least Tern and Piping Plover Monitoring, Research, Management, and Outreach Report for the Lower Platte River, Nebraska. Joint report of the Tern and Plover Conservation Partnership and the Nongame Bird Program at the Nebraska Game and Parks Commission, Lincoln, Nebraska, USA. Brown, M.B., J.G. Jorgensen, and L.R. Dinan. 2011. 2011 Interior Least Tern and Piping Plover Monitoring, Research, Management, and Outreach Report for the Lower Platte River, Nebraska. Joint report of the Tern and Plover Conservation Partnership and the Nongame Bird Program at the Nebraska Game and Parks Commission, Lincoln, Nebraska, USA. Brown, M.B., L.R. Dinan, and J.G. Jorgensen. 2016. 2016 Interior Least Tern and Piping Plover Monitoring, Research, Management, and Outreach Report for the Lower Platte River, Nebraska. Joint Report of the Tern and Plover Conservation Partnership and the Nongame Bird Program of the Nebraska Game and Parks Commission, Lincoln, Nebraska, USA. Brown, M.B., L.R. Dinan, and J.G. Jorgensen. 2017. 2017 Interior Least Tern and Piping Plover Annual Report for the Lower Platte River, Nebraska. Joint report of the Tern and Plover Conservation Partnership and the Nongame Bird Program of the Nebraska Game and Parks Commission, Lincoln, Nebraska, USA. Czaplewski, M.M., J. Jenniges, and M. Peyton. 2005. Least Tern and Piping Plover Surveys of the Central and Upper Platte River 2001-2004. NBR 73: 71-77. Dinan, J.J. 1986. Platte River Interior Least Tern and Piping Plover Survey – 1986. Nebraska Game and Parks Commission, Lincoln, Nebraska, USA. Elliott-Smith, E., M. Bidwell, A.E. Holland, and S.M. Haig. 2015. Data from the 2011 International Piping Plover Census: U.S. Geological Survey Data Series 922. U.S. Geological Survey, Reston, Virginia, USA. https://dx.doi.org/10.3133/ds922. Elliott-Smith, E., S.M. Haig, and B.M. Powers. 2009. Data from the 2006 International Piping Plover Census: U.S. Geological Survey Data Series 426. U.S. Geological Survey, Reston, Virginia, USA. Farnsworth, J.M., D.M Baasch, C.B. Smith, and K.L. Werbylo. 2017. Reproductive ecology of interior least tern and piping plover in relation to Platte River hydrology and sandbar dynamics. Ecology and Evolution 7: 3579–3589. https://doi.org/10.1002/ece3.2964. Ferland, C.L., and S.M. Haig. 2002. 2001 International Piping Plover Census. U.S. Geological Survey, Forest and Rangeland Ecosystem Science Center, Corvallis, Oregon, USA. Haig, S.M., and J.H. Plissner. 1992. 1991 International Piping Plover Census. Report to U.S. Fish and Wildlife Service, Region 3, Division of Endangered Species, Fort Snelling, Minnesota, USA. Hunt, K.L., J.D. Fraser, M.J. Friedrich, S.M. Karpanty and D.H. Catlin. 2018. Demographic response of Piping Plovers suggests that engineered habitat restoration is no match for natural riverine processes. The Condor 120: 149-165. Johnson, W.C. 1994. Woodland expansions in the Platte River, Nebraska: patterns and causes. Ecological Monographs 64: 45-84. Jorgensen, J.G. 2016. 2016 International Piping Plover Census in Nebraska (off-Missouri River sites). Draft report of the Nongame Bird Program at the Nebraska Game and Parks Commission, Lincoln, Nebraska, USA. Miller, M.P., S.M. Haig, C.L. Gratto-Trevor, and T.D. Mullins. 2009. Molecular population genetic structure in the Piping Plover. Open-File Report 2009-1032. U.S. Geological Survey, Reston, Virginia, USA. NRC (National Research Council). 2005. Endangered and threatened species of the Platte River. Washington, DC: Committee on Endangered and Threatened Species in the Platte River Basin, National Research Council, National Academy of Sciences. The National Academies Press. NPPD. 1994. Islands and Sandpits. An alternative solution for Least Tern and Piping Plover habitat in the Central Platte Valley. Brochure. Peyton, M.M. 2004. 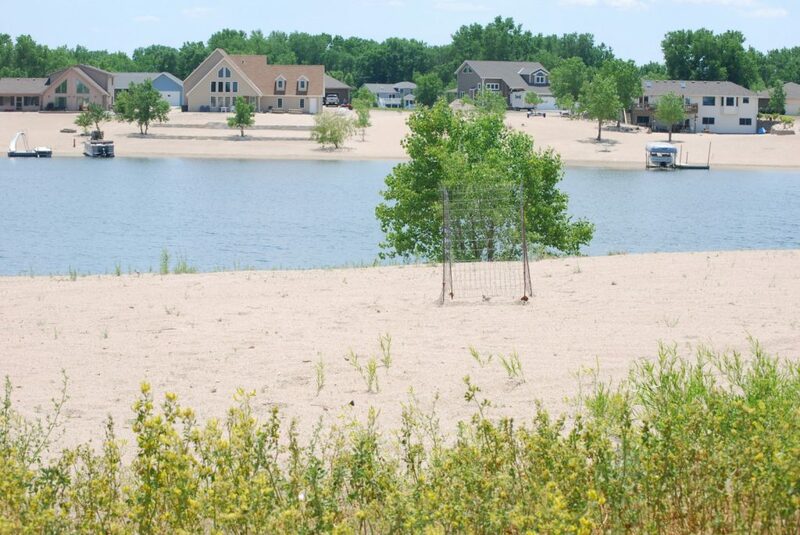 Lake McConaughy and Nebraska Piping Plover Recovery Goals. NBR 72: 148-152. Pickwell, G. 1925. Some nesting habits of the Belted Piping Plover. Auk 42: 326-332. Plissner, J.H., and S.M. Haig. 1997. 1996 International Piping Plover Census. Report to U.S. Geological Survey, Biological Resources Division, Forest and Rangeland Ecosystem Science Center; Corvallis, Oregon, USA. Sidle, J.G., E.C. Wilson, J.J. Dinan, J. Lackey, G. Wingfield, B.K. Good, G.R. Lingle, and R.G. Plettner. 1991. The 1991 Census of Least Terns and Piping Plovers in Nebraska. NBR 59: 133-149. Williams, G. P. 1978. The case of the shrinking channels: the North Platte and Platte Rivers in Nebraska (Vol. 781). Department of the Interior, Geological Survey. Zeigler, S.L., D.H. Catlin, M. Bomberger Brown, J.D. Fraser, L.R. Dinan, K.L. Hunt, J.G. Jorgensen, and S.M. Karpanty. 2017. Effects of climate change and anthropogenic modiﬁcation on a disturbance-dependent species in a large riverine system. Ecosphere 8: e01653.10.1002/ecs2.1653. Ziewitz, J.W., J.G. Sidle, and J.J. Dinan. 1992. 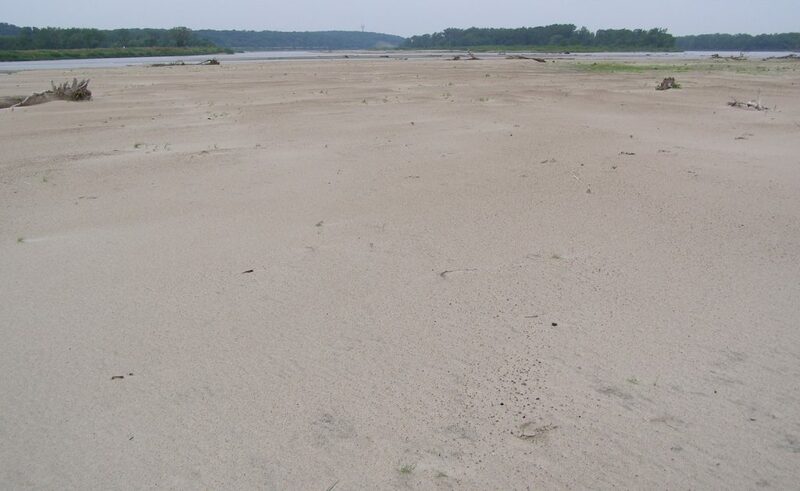 Habitat conservation for nesting least terns and piping plovers on the Platte River, Nebraska. Prairie Naturalist 24: 1-20. Zorn, D.J., and G.T. Wilson. 2016. Least Tern and Piping Plover Nest Monitoring Final Report 2016. Central Nebraska Public Power and Irrigation District, Holdrege, NE.